Email marketing is powerful because it’s both high-impact and low-cost. Many of us have our hands in our email every single day, and what we see is so much different from what we see on our social media feeds. Subscribing to an email list means getting some sort of deal or freebie, unlike following a social media account, which only promises that you’ll see more of their posts. Newsletters can also be saved for later, filtered into inbox folders or unsubscribed from altogether. This heightened level of interaction is also why newsletter signups may be harder to get than, say, Facebook likes. The barrier of entry and the stakes are higher, so people are more wary of getting involved. There is no “right way” to build your email list – what works for the shop next door may be totally wrong for you. That said, no matter how you choose to build your email list, always clarify that the individual is subscribing – don’t trick them into it. This isn’t just a nicety; it’ll also protect you legally. There are a number of techniques that are worth consideration, and from there you can test what works for your audience and what doesn’t. On that note, let’s start from the end: testing your email list building strategies. You won’t reach this step until you’ve chosen some list building strategies to test, but it’s important to know going in. Look at everything in your email list building strategy as a trial. You don’t know the copy, design or placement that’s going to convert best, so you’re testing a bunch of stuff out until you find what works. And from there, you’ll continue testing – it never really ends. You’ll take “thing that works” (A) and test it against “thing that may or may not work” (B) so that you can continually improve. Some aspects of your subscribe form that you’ll test include colors, CTA, placement on the page and pop-up timing. Don’t be afraid to get into the nitty-gritty – you could find that a form that slides out from the left of the screen converts better than one that slides out from the right. Think about the newsletters you subscribe to – what are you getting from them that makes them worthy of a place in your inbox? Do you always take advantage of a sale at a particular store? Do you like the advice a certain blog sends out each week? Do you feel like you’d be missing out if you didn’t get their newsletter? Subscribe-worthy content has to match up with what your audience is interested in overall and also what people are interested in if they’re on a specific blog post or page of your website. If you only have one or two landing pages, you’re going to miss out on a lot of subscribers. Aim for as many as 15 different landing pages so that you can customize offers to the content your readers are most interested in and to different stages of the customer journey. Let them control what they receive. Brands that have different newsletter streams can let their subscribers control what they receive. You can also let them decide newsletter frequency. For example, some subscribers may want to be part of your birthday club, but nothing more. The offers they receive will be limited – they’ll get a signup deal, like 10% off their first purchase; a special offer on their birthday; and possibly an email around major holidays, like a gift guide at Christmas. Let your visitors know they can customize their newsletter options before signing up – it may encourage people who are on the fence. Also, every time they receive an email, give them the option to sign up for more. There are a few different types of website opt-in forms. The main ones are the subscribe box, the sign-up page and the pop-up. When it comes to pop-up ads, they can appear after a user has been on the page for a certain amount of time; when the user scrolls to a specific part of the page; or when the user is about to leave the page (onsite retargeting). This is about more than simply catching someone’s eye. Injecting the pop-up with personality humanizes your brand and taps into the reader’s emotions. It’s easy to say “no” to signing up for a newsletter; it’s much harder to pass up losing weight or making more money. Do keep the lead capture form short. Make the offer obvious and limit mandatory fields to two or three. You can collect more information later as you build a relationship with your subscribers. Access VIP articles and insider tips. Download our 99% effective cold email template. Save on your first order. The user is still subscribing, but what you’re marketing to them is more valuable. Do customize subscribe content to the page. If they’re already invested in the content, they’re more likely to convert if you have a related offer for them. Do add a subscription for to the About Us page. If a visitor is on that page to read about you, then you know they’re pretty interested in your brand. 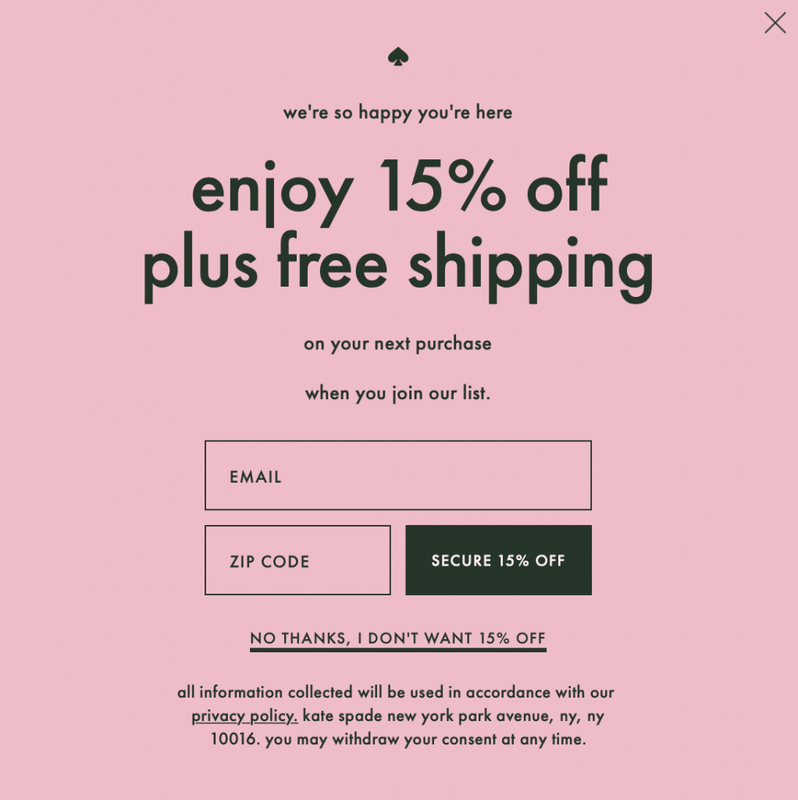 Don’t place pop-ups on sales pages; they can distract from the sales decision and interrupt the process. Do include an obvious and generic subscribe option. While it’s rare for people to seek out your subscription page, those who do will be valuable subscribers – they want your newsletter and they don’t need a flashy offer in return. There have been a number of times when I’ve wanted to sign up for a website’s newsletter because I want to hear about their latest blog posts, but I can’t find the subscribe box anywhere. 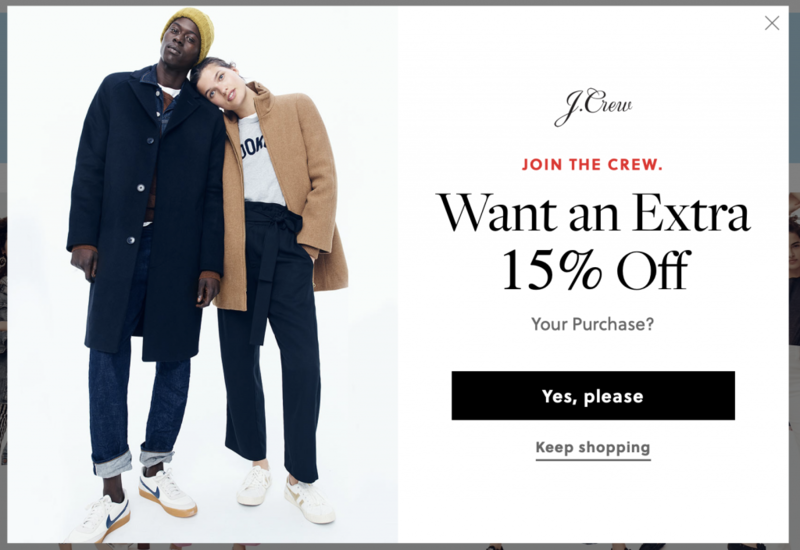 Don’t show a subscribe pop-up to a person who is already subscribed to your newsletter – you should be able to control this by tracking where the visitor is coming from. For example, if a person clicks a link in your newsletter to read a blog post, they shouldn’t see a pop-up to subscribe to your newsletter. These seem antiquated, but they’re better than nothing. They’re also useful if you have an older customer base that checks their email but isn’t reading your website on a regular basis. The sheets can be hard copy or mobile, like a simple form that you display on an iPad. 2. Ask for a subscription on the phone. All you have to do is say, “Would you like to join our email list? You get XYZ.” If the person agrees, subscribe them and make sure they get a confirmation email to finalize the opt-in. 3. Add a CTA to the comment section of your blog posts. You can require an email to leave comments or you can have a checkbox that adds commenters to the newsletter (scroll down – that’s what we have). To convert more people in this section, hold a comment contest. For example, I recently entered a pitch contest for a freelance writing website and the pitches had to be posted as comments. 4. Tap into your social media network. You may not have an email list yet, but if you have a social media following, convert some of them. Create a Facebook offer, launch a Twitter campaign, publish a link to gated content on LinkedIn or create a hyperlinked end card for your YouTube videos . 5. Include the subscribe link in your email signature. You send a lot of emails every day , and each one is another opportunity to snag a new subscriber. Ask your employees to do the same. 6. Direct mail to subscribe or update their information. If you have a physical address but not an email address, send a postcard with an online offer that will require their email. You can also send physical postcards to people who have bounced back email addresses to encourage them to update their information. 7. Include an opt-in in the unboxing experience. If you mail physical products to your customers, create a fantastic unboxing experience and put a postcard in there with an online offer. The more they enjoy opening up the shipment, the more likely they are to claim your offer. 8. Team up with a complementary brand. If you and another brand create content together – like a case study that serves both your audiences – you can also co-brand the content and cross-promote each other’s newsletters. Note that this is not the same as buying or sharing one another’s lists. Instead, you’ll send the newsletter to your list as usual and include the other brand’s signup info in it, and the other brand will do the same for you. Add a “Forward to a Friend” link in your newsletter. Don’t forget the subscribe button, too – it’s easy to leave it out because you assume that everyone receiving the email is already described. As you start to collect email addresses, make sure to keep your mailing list clean. Add user information as you can, and also eliminate errors and redundancies. If you have an old list, run a new opt-in campaign and remove unresponsive emails. You may end up deleting a lot of former subscribers, but you’ll be left with a healthier, more-engaged list. The reason there are so many email list building tactics is that every company out there has a different combination that works for them. A/B testing is going going to be your best friend as you figure out how to build an email list. If you read between the lines, every tip on this list has the same goal: catering to the customer. Let your audience drive what you offer and how you offer it. You may want to give our article on customer personas a read, too. The post Email List Building in 2019: What You Need to Know to Succeed appeared first on Elegant Themes Blog .